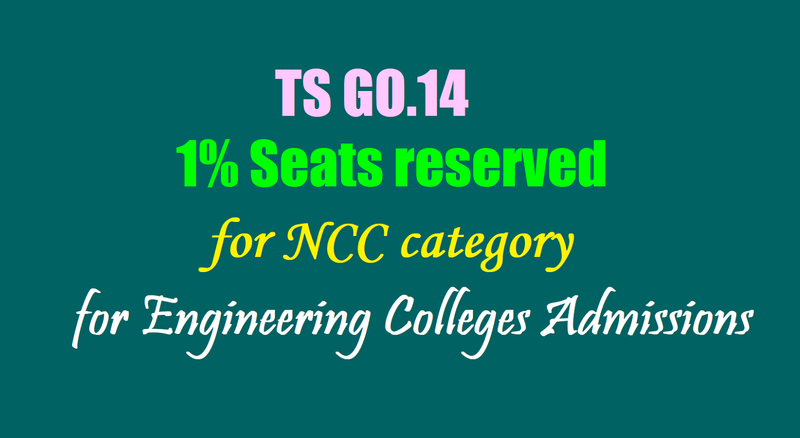 GO.14 - 1% Seats reserved for NCC National Cadet Corps for Engineering Colleges Admissions /Engineering Colleges Admissions/ 1% seats reserved for National Cadet Corps for admission into Engineering Colleges/ Reservation of 1% seats under NCC category for Admissions into Engineering Colleges. 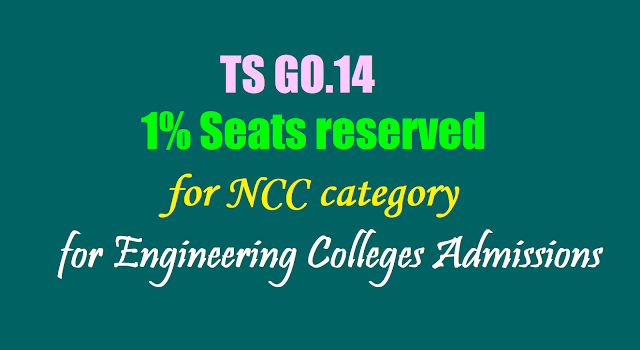 Follow the priorities for for admission into Engineering Colleges(TS EAMCET) for 1% seats reserved for National Cadet Corps. G.O.Ms.No. 14 Dated: 09-06-2017:: GOVERNMENT OF TELANGANA:: HIGHER EDUCATION (TE) DEPARTMENT - Higher Education Department - Technical Education - Admissions into Engineering Colleges - Reservation of 1% seats under NCC category - Priority in respect of "other categories" under NCC Quota - Amendment - Issued. 2.From the Dy.DG, NCC(AP&T) Lr. No.1972/Scr App/P&C, dt.23.04.2015. 3.From the Dy.DG, NCC(AP&T) Lr. No.972/Scr App/P&C, dt.07.06.2017. a) NCC Cadets – the winners of Gallantry/National Bravery Awards/Raksha Mantri Padak. b) NCC cadets participating at International Level for Youth Exchange Programme (Priority within selected cadets will be given in the order of seniority of the Certificates i.e. C,B & A Certificate holders). c) NCC Cadets participating at International Level competitions/events in Para Jumps/ Skydiving/ Mountaineering/Sailing/Para Sailing/Rafting/ Canoeing & Kayaking/Shooting/ Equestrian that are organized by respective International Federation(s) of that particular sport and while representing India/the NCC. (a) Medal Winners in the Republic Day Camp at New Delhi in any event. (b) NCC Cadets participated at the Republic Day Camp at New Delhi. (g) NCC Cadets participating in National Integration Camp at Andaman & Nicobar Islands, Leh, NER and Srinagar. a) Participants at the Republic Day Parade at the State Level. 1. Priority will be considered in C, B & A Certificates attained prior to appearing in the qualifying examination i.e. Intermediate/ +2 examination. 2. The NCC Directorate, Andhra Pradesh & Telangana shall be responsible to draw the merit list in respect of the NCC cadets seeking admission under NCC category for all the candidates. 3. In case of a tie, EAMCET/CET merit will be the deciding factor for position in the merit list under NCC category. 4. Only NCC Certificates issued by the NCC authorities shall be valid. 5. The above priorities will be given to the Certificates acquired if the candidates represent through NCC only and the same has to be endorsed on the Certificate.